Every page you Stache is stored and displayed with a beautiful screenshot, helping you identify and preview pages quickly. 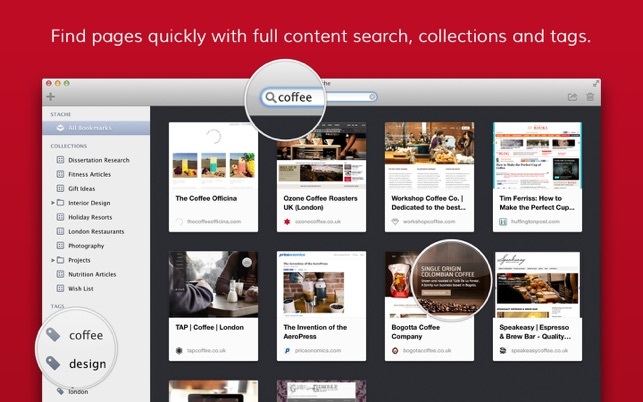 Complete content search makes it quick and easy to find pages even if you can’t remember the site name or page title. 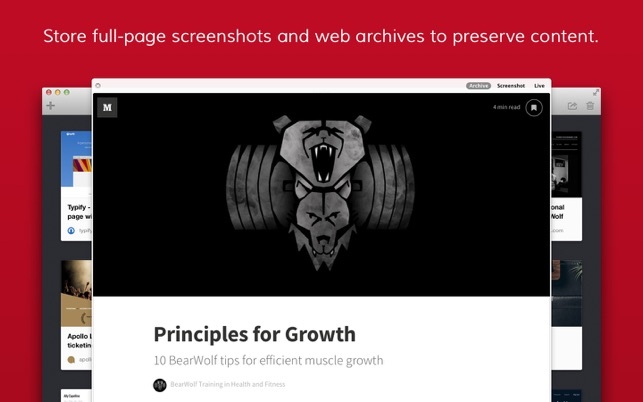 A full-page screenshot and web archive is stored with every bookmark to archive the page content and design. Perfect for collecting inspiring designs and preserving content in case the page changes or goes offline. Select a bookmark and hit space to see an instant full page preview, ideal for quickly glancing over a page without leaving Stache. Group and organise bookmarks with collections, folders and tags. 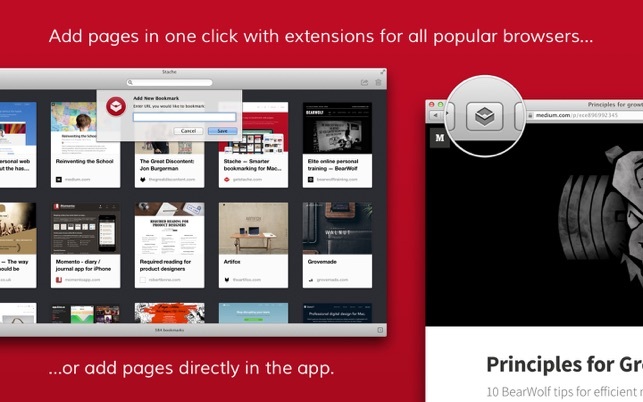 Stache integrates with Safari, Chrome, Firefox and Opera to make bookmarking as simple as a single click. Just hit the Stache icon or Alt+S to stache a page. A bookmarklet is also available for other browsers. Whether you’re collecting articles for research in your studies, pages of useful products for an upcoming project or archiving inspiring site designs, Stache is there to make all that information accessible when you need it. - Improved exporting with preservation of folders and collections. - You can now export images and web archives. For the record, I want to say that Stache was a great app back when it was still in development, years ago. It had it’s bugs and quirks, sure, but overall it did bookmarking and link saving very well, in an efficient, easy to use way. However, the 1 -star review is to ward off others from purchasing Stache, as it has been discontinued; according to the developer’s twitter, development on Stache ended mid-2016. Quiet frankly, I’m very dissapointed the developer continues to keep the app on the App Store, priced at nine dollars, without notifying potential buyers that the app has been discontinued. It’s not even listed on the app’s website, I had to track down their twitter to find this out! Though the copy of Stache I have on my machine continues to work on macOS High Sierra, I’m sure it won’t be that way for much longer. It’s not right that the developers continue to sell this product and maintain a product page for it without being honest with users about its state of development. 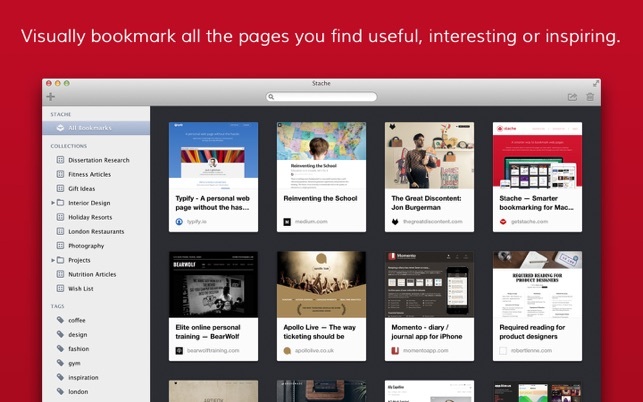 Please don’t buy Stache; if you’re looking for a visual bookmarking app, look elsewhere to invest your money. Used this product before and liked it. Whent to reinstall on a new machine and see that it no longer syncs across devices. Received this auto response. Not sure why this product is still for sell if it is retired. Unfortunately we can no longer provide email support for Stache. The product has been retried for the time being until we have the opportunity to resolve some significant bugs which have affected users running macOS Sierra. At present we are focussing on other projects and as a small team we don't have the resources to resolve these issues at this time. For this reason we have removed the app from the App Store. We too use Stache for all our bookmarking needs and this has also prevented us from using the product. If you wish, you can export your bookmarks out of Stache (macOS) using the 'Export' function. If you have recently purchased Stache from the Mac App Store, you can request a refund from Apple via iTunes. We hope we can resurrect the project in the future and sincerely apologise for the inconvenience this may have caused. I don’t know what many of the negative reviewers have a beef is; Stache is the best thing since, well, Chrome’s bookmark bar. It’s like Pinterest but easier, better and more streamlined. I’m very happy to see the newer versions have the “Export” option, but I’d like to see down the road the ability to export not only the bookmarks but the screencaps, too, so that I could easily export all my Stachemarks in a particular folder to a single directory organized in an HTML file with the same visual benefits of Stache. I can’t imagine how I got by before Stache! Three thumbs-up to the developers!